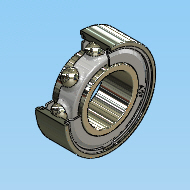 As engineers and designers examine the use conditions in their ball bearing application, including loads & speed, the expected life and safety factor will influence the final selection of the bearing size. AST Bearings proudly presents this newly-developed tool for your convenience, which easily calculates ball bearing life and safety modulus with just a few inputs. 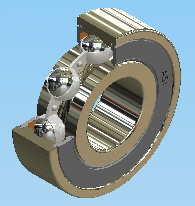 When bearings rotate, the inner and outer rings and rolling elements are constantly loaded. This produces material fatigue and eventually bearing failure. The total number of revolutions before a failure occurs is called the basic rating life. Life of individual bearings varies considerably, even if the bearings are the same size, same material, same heat treatment and are under the same operating conditions. Statistically, the total number of revolutions reached or exceeded by 90% of a sufficiently large group of apparently identical bearings before the first evidence of material fatigue occurs is the basic rating life. A bearing system, whether stationary or during rotational motion, could be subjected to unforeseen applied loads and inertia, such as vibrational forces, impacts, shock loading, and start-and-stop action. 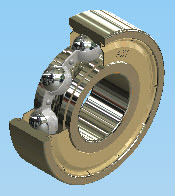 To ensure that an appropriate bearing size is selected, a proper safety factor must be applied. The bearing safety factor, or safety modulus fs, is the ratio of the basic static load rating Cor the equivalent load P on the bearing. When the use conditions are normal operation, a safety factor of 1.0 is typical. If the bearing system may be subjected to possible shock loads, the designer may wish to increase the safety factor to 1.5. If silent and high accuracy bearing rotation are desired, a minimum safety factor of 2.0 may be required. A high enough safety factor will prevent the permanent plastic deformation condition caused by excess load between the raceway contact areas and the rolling elements. The load ratings, formulae, adjustment factors, table values, and other technical data contained in AST Bearings’ catalogs and website are intended to provide guidance in making bearing selections, but may not be applicable in all operating conditions. Customers must ensure that an experienced and knowledgeable design engineer performs a comprehensive analysis for their specific applications. 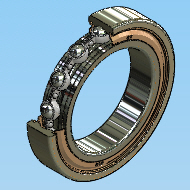 AST Bearings assumes no liability for final bearing selections and specifications. If you have any questions or concerns regarding this calculation tool, or if you have operating conditions where this calculation tool cannot be used for your specific application, please contact AST Engineering and we will be happy to assist you.